BUDAPEST, Hungry (October 20) – On a day that saw three Olympic champions stumble it was youngsters from Russia and Georgia who proved to be the stabilizing antidote to chaos on the first day of wrestling at the 2018 Wrestling World Championships at the Papps Laszlo SportArena in Budapest. Leading the way for Russia were wunderkinds Gadzhimurad RASHIDOV (57kg) and Zaurbek SIDAKOV (74), both only 22 years old. While Rashidov was dominant throughout the day, Sidakov had arguably the toughest road to the finals, needing to defeat four-time world champion and Olympic champion Jordan BURROUGHS in the quarterfinals and then defeated two-time world champion Frank CHAMIZO (ITA) in the semifinals. The Georgian effort was spearheaded by defending world champion Geno PATRIASHVILI (125kg) who battled through back-to-back tense matches with Anzor KHIZRIEV (RUS) and Parviz HADI (IRI) to earn his second straight trip to the world finals. His finals compatriot, Avtandil KENTCHADZE (GEO), 22, breezed through the semifinals, earning a chest lock and fall in the second period against 2018 European Champion Soner DEMIRTAS (TUR). DENG Zhiwei made history at 125kg, becoming the first freestyle wrestler from China to make the world finals. “I’m always having dreams about wrestling, and I’ve dedicated my life to the sport for the past 16 years…Now I get to bring honor to my country,” said Deng. Russia would have placed a third in tomorrow night’s finals were it not for an unlikely series of comebacks by David TAYLOR (USA). The fast-paced, rubber-kneed American had a career day, starting with an 11-6 decision over 2016 Olympic Champion Hassan YAZDANICHARATI (IRI). Taylor trailed 6-2 at the end of the first period before rattling off nine unanswered points to earn the win. Taylor faced Dauren KURUGLIEV (RUS) the semifinals, where early in the match he took a swinging heel to the lower jaw, unbalancing him and briefly stopping the match. Rattled, but undeterred, Taylor fought on, but trailed 5-1 heading into the second period. 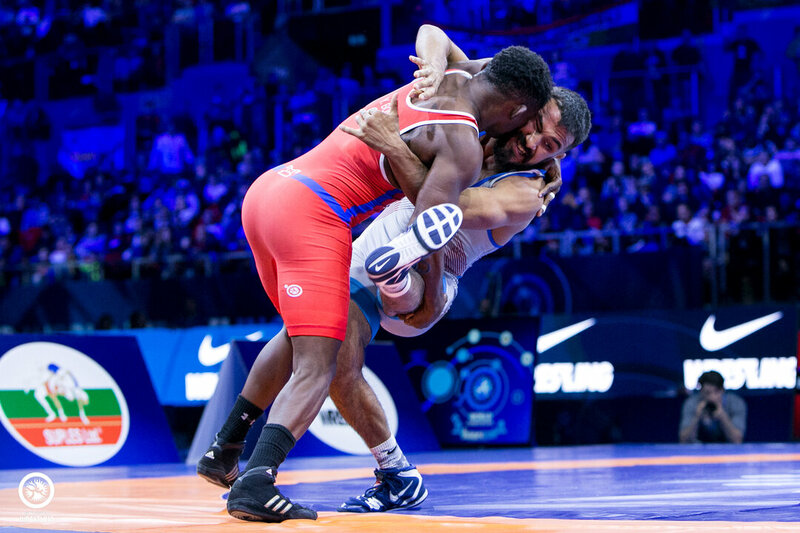 But as he did against Yazdanicharati, Taylor found another level and immediately began attacking, eventually securing three takedowns and a pushout for the 7-5 victory. After the match, Taylor said, “I’d trade a kick in the face for a world championship any day.” He then dedicated his victory to a training partner and teammate who was severely injured last month during a training session in the United States. “Perry Strong. Strong like Rich Perry. He’s a fighter.” said Taylor. When fan-favorite and two-time world bronze medalist BONNE-RODRIGUEZ (CUB) made his international debut at the 2005 Pan-American Championships, Gadzhimurad RASHIDOV (RUS) was only 9 years old. They’ll meet tomorrow night for the 61kg gold medal. Sunday night’s finals will be the first time that the 34 year old Cuban has made a gold-medal bout, while Rashidov is looking to rebound from his silver medal performance from last year's World Championships. Tomorrow’s wrestling action starts at 10:30 am with championship action in 57kg, 65kg, 79, g and 92kg along with repechage from today’s weight categories. Finals will start at 7 pm local.